Review: 2012-12-15, great first round and good finish between George Sotiropoulos and Ross Pearson: three stars. Ross Pearson ranked as the No.30 featherweight in the world, entered the fight with a record of 13-6-0 while George Sotiropoulos had a record of 14-4-0 (Sotiropoulos is not ranked as he hasn’t fought since July 2, 2011 when he was defeated by Rafael dos Anjos). 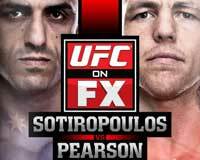 Sotiropoulos vs Pearson is the main event of UFC on FX 6. Watch the video!